Can you get the sausage out the exhaust pipe please? I thought this ran on unbreaded. John knows how to attract the birds. BMW is a cut above the rest. We don't like the umbrella, what else you got? ...with up to 560 bake coarse flour. The careful BMW driver always Braces themselves for a collision. "If I fill all the spaces with bread, there's no way that a bird will get stuck in the grill now." He's got a Tiger in his tank! "Can I have some Bread, Medium White please." My other car's a bit of crumpet. "Sorry officer, I didn't see him. 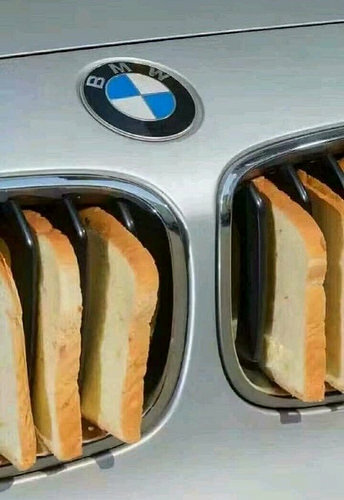 I guess he's now toast"
I bought this BMW to show I've got the bread. If you're living on the breadline, you won't be able to afford this toaster.